One stop dog treat shop to open on Boulder Street in LoHi. Dogs won't be able to keep their paws off these baked goodies. Three Dog Bakery, a Kansas City-based chain will soon be opening a shop at 1503 Boulder Street. Hands off, humans, this is a bakery exclusively for canine companions, serving up seasonal treats, dog pastries, and Pupcakes, a one-of-a-kind canine cake that can be personalized for your pup. 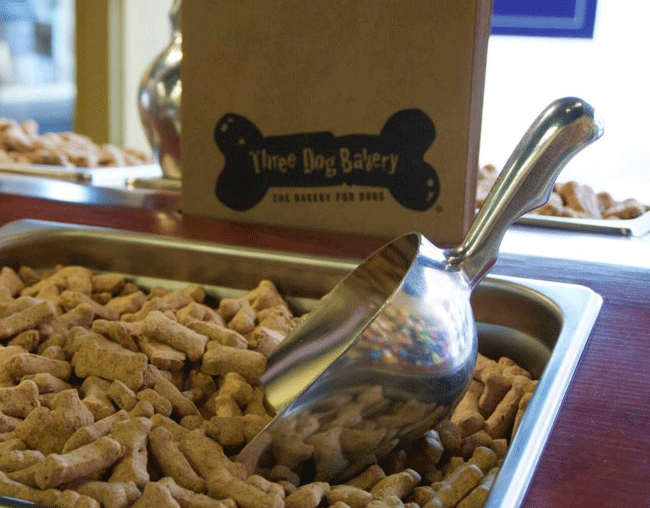 "Three Dog Bakery is an unforgettable experience for dogs (and their two-legged parents). The only thing you need to watch out for is exuberant wagging tails — dogs often go into full-body wagging mode!" says the company website. This location is just one of nearly 50 franchises across the United States. It also has three in Hong Kong and two in Canada. It is part of a growing movement of pet-only services that cater solely to our furry friends. Founded in 1989, Three Dog Bakery was originally the result of a sweet little pet with a super-sensitive stomach. "When the run-of-the-mill dog food made her sick, we decided to learn how to bake," says the site. "When all of that was too much to contain in one little kitchen, we opened the world's first bakery for dogs." The treats that will be offered are made in small batches and contain real ingredients that you could eat, if you so chose (check them out). There is no opening date listed on the bakery's website, as of yet, but you can check out the Denver location page for updates. Where to get the pur-fect holiday pet portrait in Denver!